Please take a few moments to check out the branch event calendar of events planned for 2019 and consider keeping some of the dates free to come along to join in. More information will be appear on this page when bookings open. You can be sure of a friendly welcome! Easter Weekend heralds the start to the 2019 Events Calendar. and a Weekend Rally in Bembridge led by Ian and Sue Fellowes-Freeman. To help celebrate the Easter Festival please make an “Easter Decoration” for your boat (can be as simple or complex as you wish) maybe to hang from a guardrail or anchor, decorate a wheel or tiller, sit on the coach roof or flutter from a halyard! Bookings can be made for The Nab Tower Race or Bembridge Rally alone or for both. Here’s hoping for some fine weather and fair wind sailing. We have booked for up to 12 boats in the marina, please call the dockmaster on vhf channel 80 or telephone 01202 649488 on arrival for directions of where to berth. Sunday evening Pontoon drinks party and a light supper, finger buffet style, all to bring a plate to share, we will ask you to bring either a suitable starter, main or pudding, unless you have a preference for preparing something savoury or sweet, please let us know. Please select your menu choices for Saturday Night from the Booking form and indicate if you wish to join the trip to Wareham. Please Fill in the Booking Form (PDF and Word) and email back to us at, m.glyde@icloud.com. Please confirm on your email how much you have transferred. Please join us for our Rally to Lymington on the second May Bank Holiday weekend Saturday 25th to Monday 27th May. We have booked berths for 15 boats on the Dan Bran pontoon. On the Sunday morning we have arranged a guided walk with Lymington Town Tours entitled Sea, Salt and Smuggling. This 90 minute walk along the waterfront covers how important the river has always been to the town. Before the 1960s and the coming of tourists to Lymington, the Quay was a very rough working area. Ships brought coal to fuel the sea salt industry, and shipped the salt out to ports all over the world. Smugglers plied their trade, and in the 1700s the writer Daniel Defoe visited and reported that the town was “teeming with smugglers and all sorts of desperados“. The cost of the walk is being met out of Solent Branch funds. 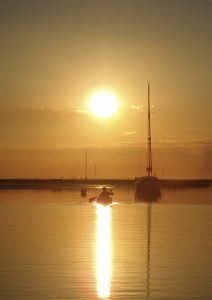 The rest of the day is free to relax and socialise and enjoy all that Lymington has to offer. Monday is free for our return to our home ports. Please complete the attached booking form (Word and PDF) and email to solentvicecap@moodyowners.org and send payment for the Saturday night meal. If due to unforeseen circumstances you have to cancel then there will be a full refund for the evening meal for cancellations before Friday 17th May, and a £5 per head charge after that. We would be very grateful if people could book before Friday 11th May as that will help with the planning and arranging guides. Solent Branch members can be found in most harbours and marinas along the South Coast between Poole and Dover and the Solent Branch Committee works hard to deliver events across the year to provide opportunities for us all to meet up. The Solent Members Forum is the place to visit to view “Event Sign Up Lists” and any other information your Branch Committee chooses not to make available to the “world at large”. You can view the Solent Members Forum via the Forum Dropdown menu or by clicking the link in the box immediately below the Latest information area on the Solent Homepage. If you access the Solent Members Forum via the Information Exchange you may find you have the discussion tab highlighted – if so click the overview tab to view the full version of the information. You need to be logged on to the website to view the Solent Members Forum in the same way as you need to be logged on to access the Technical Library or to view entries on the Info Exchange. If you have forgotten your password or username please visit the Members tab on the Main Menu where you will find help. We issue periodic email updates and a copy of each email can be viewed in the Solent Members Forum. Sometimes Solent Branch members will suggest an “Informal Meet” – a simple gathering! The idea is that people will simply turn up at a particular location and be responsible for making their own anchoring or berthing and dining arrangements. The whole idea is based on informality and spontaneity. If you spot an opportunity to propose an Informal Meet, why not take a chance and send a message via the Solent Branch Discussion Board. Alternatively, if you are already afloat you could try using your VHF radio or its DSC function to broiadcast a message. The Solent Branch uses VHF Channel 77 and has adopted a group call sign of Compass. Our group DSC MMSI number is 023200031. If you do enjoy a successful meet please send a short report with photos (if you have any) to our team of website updaters to help encourage other Branch members to participate. The theme for this year’s photographic competition is “At the end of the day”. The prize is a framed print of your winning photo. To be eligible photos must be taken by a member of the MOA Solent Branch or their crew this season. To enter send your photos to Neil O’Connor by 31st December 2018. Please include your name and the title of your photo. Last year’s winner was “Jouster M336 Newtown Creek” by James and Jackie Macbeth.